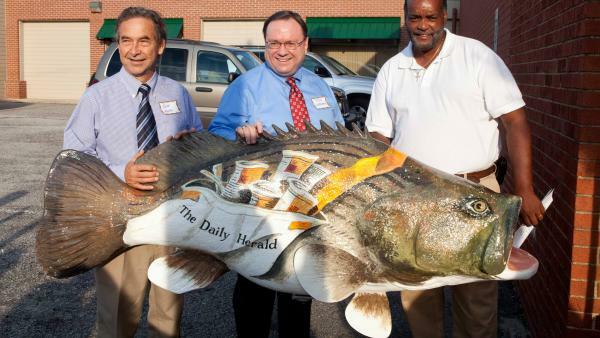 The Daily Herald, the number one source of news and information for residents of the Roanoke Valley, proudly released “Newsie” the rockfish during the August Business After Hours, which the newspaper hosted for the Roanoke Valley Chamber of Commerce. “Newsie” was painted by Napoleon Hill and is based on the newsboys who often delivered newspapers using sacks, which hung from the shoulder straps around their necks. These newsboys were affectionately known as newsies. The Daily Herald is pleased to participate in and support The Roanoke Valley Rocks public relations/public arts campaign. You can catch “Newsie” in the parking lot next to the front entrance of The Daily Herald building on the Avenue in Roanoke Rapids.